Baliuag is a first class urban municipality in the province of Bulacan, Philippines. According to the 2015 census, it has a population of 149,954 people. Baliuag was founded on 1732 by Augustinian friars and was incorporated by the Spanish Governor-General on 1733. The town was a part of Quingua (now Plaridel) before. Five days before May 6, 1899, Henry Ware Lawton's troops marched to Baliuag, after the fateful and bloody encounter at the "Sabang, Baliuag Battle". Baliuag was the first Municipio ever created during the American regime in the Philippines, on May 6, 1899, five days before the fateful "Sabang Battle". Augustinian friar, Fr. Joaquín Martínez de Zúñiga, OSA, in his "1803 Historia de las Islas Filipinas" wrote that the Convent or Parochial house of San Agustin, in Baliuag, is the best in the whole Archipelago and that no edifice in Manila can be compared to it in symmetry and beauty amid its towering belfry, having been a viewing point of the town's panorama. The frayle further stated that the Convent was a repository of priceless parish records which dated to the founding of Baliuag as a pueblo or parrochia by the OSA or Augustinians in 1733. But the first convent was erected at Barangay Sta. Barbara, Baliuag before the Parokya was formally established at the now Plaza Naning, Poblacion. Fr. Joaquín Martínez de Zúñiga arrived in the Philippines on August 3, 1786 and visited Baliuag on February 17, 1802 with Ignacio Maria de Álava y Sáenz de Navarrete. Their host was Baliuag's Parish Priest, Fray Esteban Diez Hidalgo. Fr. Diez served as the longest cura parroco of Baliuag from 1789, having built the church and convent from 1790 to 1801. Spanish records ("Apuntes históricos de la provincia augustiniana del Santísimo Nombre de Jesús de Filipinas", año 1909: Filipinas, by P. Bernardo Martinez) reveal that Fr. Juan de Albarran, OSA was assigned Parish Priest of Baliuag in 1733. The first baptism in Baliuag Church was ordered by Fr. Lector and Fr. Feliz Trillo, Provincial of the Province on June 7, 1933 while Baliuag was founded and began its de jure existence on May 26, 1733. The pueblo or town was created in the provincial Chapter on May 15, 1734, with the appointment of Fr. Manuel Bazeta/Baseta as first cura parroco. In 1769-1774, the Church of Baliuag was built by Father Gregorio Giner. The present structure (the third church to be rebuilt, due to considerable damage during the 1880 Luzon earthquakes) was later rebuilt by Father Esteban Diaz using mortar and stone. The 1866 Belfry was also completed by Father Matias Novoa but the July 19, 1880 quake damaged the same which was later repaired by Father Thomas Gresa. The earthquake of June 3, 1863, one of the strongest to ever hit Manila, destroyed the Governor's Palace in Intramuros. Malacañang then, became the permanent residence of the head of the country. The massive quake also damaged the Baliuag Church. In 1870, the reconstruction began when a temporary house of worship, the “Provincial”, along Año 1733 street, emerged as a narrow, and simple edifice which later used by the RVM Sisters of the Colegio de la Sagrada Familia (now St. Mary's College of Baliuag) as classroom. Antonio de Mesa, “Maestrong Tonio" fabricated the parts to have finished the Spanish-era Baliuag Church. Baliuag had 30 curates (1733–1898): Fr. Esteban Diez Hidalgo and Fr. Fausto Lopez served 40 and 24 years, respectively. Fr. Lopez had 6 children with a beautiful native, Mariquita: Dr. Joaquin Gonzalez, Francisco, the former Assemblyman Ricardo Lloret Gonzales (Legislative districts of Bulacan, 5th Philippine Legislature, and Jose the eldest who was widely known as “Pepeng Mariquita", inter alia. Spanish cura parroco, Fr. Ysidoro Prada served in Baliuag during the last decade of Spaniard regime. The Philippine-American civil and military authorities supervised the first municipal elections, having chosen Baliuag as the site of the first Philippine elections of May 7, 1899. The Filipinos gathered at the plaza of the St. Augustine Church after the Holy Mass, and thereafter the officials were selected based on the qualifications for voters set by the Americans. The first town Gobernadorcillo (1789 title) of Baliuag was Cap. Jose de Guzman. He was assisted by the Tribunal's teniente mayor (chief lieutenant), juez de ganadas (judge of the cattle), juez de sementeras (judge of the field) and juez de policia (judge of the police). In the History of the Philippines (1521–1898), the 1893 Maura Law, the title of Gobernadorcillo became "capitan municipal" and that of each juez to teniente. From Baliuag's independence from Quingua, now Plaridel, Bulacan to 1898, 49 served as capitan, 13 alcalde and 92 as Gobernadorcillo. Felix de Lara (1782) and Agustin de Castro (1789) were the 1st alcalde and Gobernadorcillo, respectively. Municipal President Fernando Enrile, in 1908, honored some of these officials, even naming some of Baliuag calles in their honor, later. But all these political officials remained under the thumbs and the habito, of the autocratic Augustinian friars, the Baliuag Kura Parokos. Principalias or town castles, in the Hispanization of Baliuag, became the home of the rich and famous, who sported the titles of Don or Capitan (shrewd, hard-bargaining businessman, the highly successful professionals and even the parvenus, nouveaux riche). The local government of Baliuag used as first Municipio under the American regime (History of the Philippines (1898–1946)) the Mariano Yoyongko (Gobernadorcillo in 1885) Principalia in Poblacion (now a part of the market site), which it bought from Yoyongko. On September 15, 1915, Baliuag municipality bought the heritage mansion and lot of Dr. Joaquin Gonzalez. The Gonzalez old mansion served as Lumang Municipio (the Old Municipio or Town Hall Building, as seat of the local government) for 65 years. It is now the Baliuag Museum and Library. Baliuag produced not less than 30 priests, including 3 during the Spanish-Dominican, and 2 Jesuits during the American regimes. Jeorge Allan R. Tengco and Amy R. Tengco (wife of Lito S. Tengco), philanthropists, owners of Baliwag Transit and other chains of business establishments had been conferred the Papal Orders of Chivalry October 3, 2000 Pro Ecclesia et Pontifice and the 2012 Dame of the Order of St. Gregory the Great awards. Mariano Ponce was a native of Baliwag. He was a founding member of the Propaganda Movement together with José Rizal and Marcelo del Pilar; a former assemblyman of the second district of Bulacan to the Philippine Assembly; and the co-founder of La Solidaridad with fellow co-founder Graciano López-Jaena. His most common names are Naning (the Plaza Naning in Baliwag being named after his nickname); Kalipulako, named after Lapu-Lapu; and Tigbalang, a supernatural being in Filipino folklore. Baliwag is politically subdivided into 27 barangays. 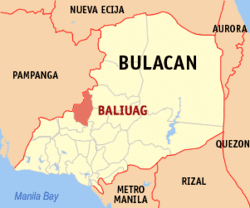 In the 2015 census, the population of Baliuag, Bulacan, was 149,954 people, with a density of 3,300 inhabitants per square kilometre or 8,500 inhabitants per square mile. Baliuag University (former Baliuag Colleges) - founded in 1925 and is the first school granted full autonomy in Region 3 by the Commission on Higher Education (CHED). It offers graduate programs in education, business, library science and nursing. Its undergraduate programs in business administration and accountancy, liberal arts and education are Level 3 accredited. 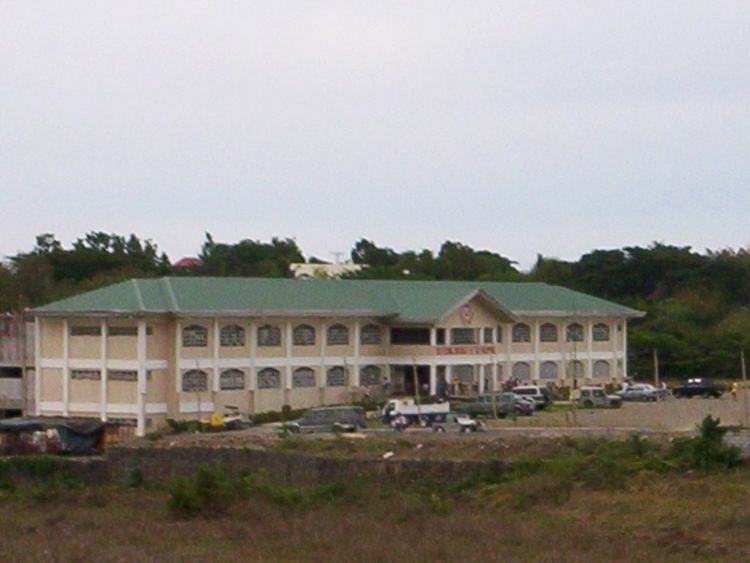 Other offerings which are equally highly accredited by the PACU COA are engineering, nursing, library science, computer studies and hospitality management. It also offers 2-year Tech-Voc, Associate in Health Science as well as pre-elementary, grade school and high school programs, LET review classes, call center training and college evening programs. It is also one of the four IMCI (Integrated Management of Childhood Illness) training school in the Philippines, together with University of the Philippines, University of Sto.Tomas, and St.Paul College Ilo-ilo. St. Mary's College of Baliuag - (St. Mary’s College, St. Mary’s, SMA, SMCB) is a Catholic school for both boys and girls. It is administered by the Religious of the Virgin Mary, the first pontifically approved congregation for women in the Philippines. It was formerly called Escuela Catolica de Baliuag, and was founded in 1912. It is located along Benigno S. Aquino Avenue and Racelis Street, Poblacion, Baliuag, Bulacan. It provides preparatory, primary, secondary, and tertiary education. The present site is a former Catholic cemetery, behind St. Augustine Parish Church. Baliwag Transit, Inc. is one of the largest bus transportation system in the Philippines with offices and terminals in various parts of Luzon. It mainly services routes to and from Metro Manila and Central Luzon. Most of its terminals are located in Nueva Ecija, where some of its terminals are located in Baliuag, Cabanatuan and San Jose. The Head Office of Baliwag Transit, Inc. is located in Baliuag, along Cagayan Valley Road, Brgy. Sabang. There are three (3) major transport lines in the municipality: The Baliuag-Candaba (Benigno S. Aquino Avenue) road going to Pampanga (from the Downtown Baliuag to Candaba Town Proper), the Old Cagayan Valley road (Calle Rizal) and the Dona Remedios Trinidad Highway (Daang Maharlika) going to Manila and Nueva Ecija. The town is 52 kilometers north of Manila. Which takes usually one (1) hour in term of travel time. 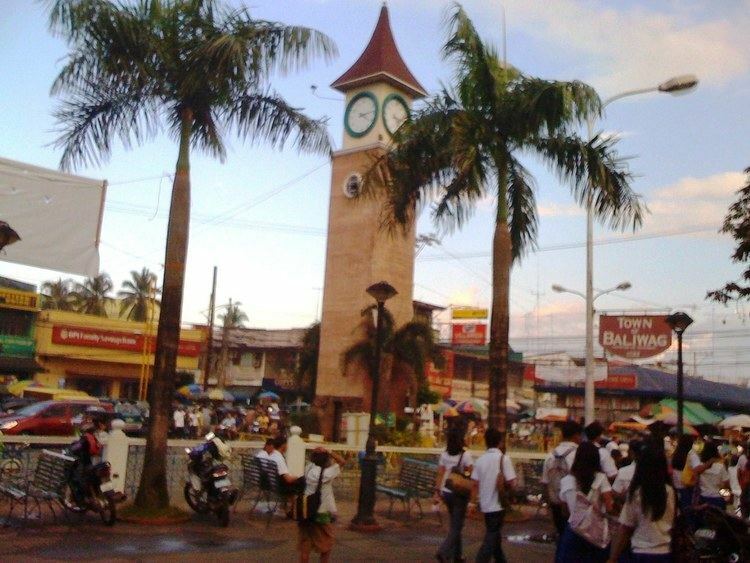 Baliuag is the home of the first self-supporting clock tower in Bulacan. Baliuag is the place where the first elections in the Far East were held (1899). Baliuag is famous for its Semana Santa (Holy Week) processions, being hailed as the Longest Religious Procession in the Philippines. As of 2016, boasting 116 carros or carrozas (floats) with life-sized santos (statues) joined in the parade showcasing events from the life and passion of Christ. Buntal Hat Festival is a celebration of culture of Buntal Hat making in the town that is simultaneously celebrated with Mother's Day annually. Colorful and grandiose decorations and street dancing are the highlights of this celebration.